There is a lifetime guarantee on materials and workmanship for all Vesper Tools products. If it breaks or has any other problems unrelated to mis-use or abuse and entirely related to manufacture or materials then it is absolutely covered no question. Needless to say returns/repairs are extremely rare but get in touch if there is ever a problem. 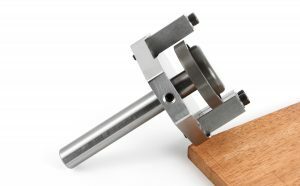 I’m new to woodworking, which minimal measuring and marking tools do I need to get started? No matter what sort of woodworking you plan to do, you need a good square, a marking knife, cutting gauge, sliding bevel, and a couple of rulers as your ‘everyday’ tools that will get used every day no matter what you do. By choosing the average size tool to purchase (7″ bevel and 7″ square for example) you can enjoy the general use of the nicely sized tools, then add the other sizes larger or smaller at a later date if you have a need to do so. Consider the Joinery Kits offered by Vesper Tools, they offer the fundamental tools to get you started at an encouraging price. And don’t disregard quality even if you choose not to purchase from us, buy the best you can afford – always!! Here at Vesper Tools we are a very busy one man artisan run business. Please see the Delivery and Backorders Page. Your tools seem quite expensive. One must compare apples and oranges, the quality level of Vesper is above any other alternative similar product. One can talk about materials and tolerances of manufacture. But the true quality which encompasses design, the weight and feel and subtle details all finished by hand are impossible to convey over the internet. We could make lesser quality and cheaper tools like everyone else but there is no point in that. The hours and hours involved in making small batch production items by hand is very involved and even at current pricing our tools are underpriced for their quality and workmanship. What timbers do you use for handles and infills, and why? Please visit the Timbers Selection page LINKED HERE for your convenience. Yes it really does cost that to ship a small parcel to the USA and more to the European side of the globe. We now use DHL for door to door service and these guys are no mucking around. 3 days door to door is normal, amazing really. The government run postal system is actually more expensive at around double the price for their express service which is not a true express service. And similar price in the $40+ range to ship 500g anyway plus insurance (definitely a good idea for the postal system). Check the Auspost website yourself by all means and you’ll see we are all between a rock and a hard place with this matter. Yes we at Vesper Tools are sorry about making you pay $44 for shipping for one little thing but this is the way the world has gone. 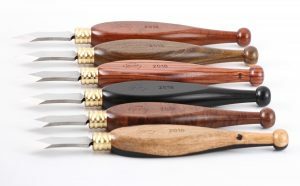 Order more than one item to bring your per unit cost down, for example we can ship 4 spoon carving tools in a 500g parcel for the same price, thats $10 each. Not so bad after all, but yes it hurts the pocket for just one item. Vesper Tools does not have shop front with a staffed sales counter. Based in an industrial area our focus is making tools as efficiently as possible to highest possible standards. We are a small business with many commitments so we may not be here if you turn up un-announced. That said we are quite happy to show folks around if time permits and an appointment is made. Generous and spontaneous donations to the yet to be formed Vesper Tools Benevolence Fund are always appreciated but not compulsory. Do your tools need maintenance or polishing? Shellac is the finish applied to my tools. It is a natural product, its easy to apply by hand, and it is easy to repair should you wish to re-sand or cut back a damaged tool with steel wool before you re coat with your choice of shellac. Only 2-3 coats is necessary. Shellac polish is wonderful to hold in the hand, given time and being pushed around workshop it will scratch a little, you can either leave the tool to patinate naturally, or you can choose to re-polish it occasionally if you wish. Do you personally make all the Vesper branded items? 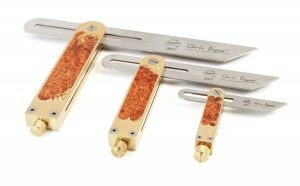 Yes – All tools branded Vesper are made by my own hand with some assistance in my own workshop in Melbourne, Australia. These tools really are limited in availability to what 1-2 people can produce per year. We do sell other high quality brands that complement my range though, such as Mitutoyo, M-Stein, Glen-Drake. You have a large selection of marking knives. And why not just use a sharp pencil? Marking knives are for those who feel the need to step up their woodworking from the limited precision a pencil gives, we all started with pencils that is for sure but eventually it becomes too ambiguous to work to the left or the middle or the right side of that damn pencil line. A knife line is absolute for accuracy. All knives on the website here have a flat back and a beveled side much like a chisel. The flat side goes against your square or ruler blade to making a line as the knife is dragged towards you. The different knives on offer are for different handle size selection, or different blade size. The larger heavy Joinery Knives and Mini’s are for general work, pretty well indestructible and nice to use. The Cohen knives are more special purpose. Thinner blades are more fragile, ruling them out for most general work but for where you are marking fine dovetail joints for example they are indispensable.